If you were to ask me what's the one thing I hate most about advertising, I'd say Times Square. 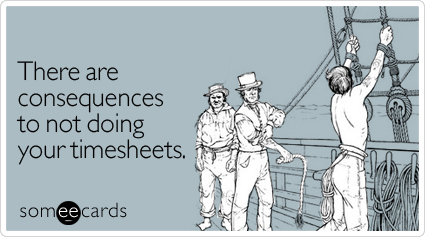 And then I'd say timesheets. We're not lawyers, we're not making lawyer salaries and still each of our hours is billable and has to be accounted for to a client and a project. If I write copy about twiddledinks for 3 and a half hours then I have to put 3.50 next to TWDNK998 in my time sheet. And every day, I have to have at least 8 hours billed toward something to prove my value. Every project has a time code. Every job has a number. Every hour you work has to be logged. The problem is, some days I work 14 hours and then the next I work 5. Or some days I putz around on Ads of the World for 2 hours and am only productive toward a client's job for 6. Or some days I am showering and thinking about a campaign and have already put in 2 hours worth of thinking before I even make it into the office. It's tough to think about just exactly how much time you spent thinking. Or writing. Or drawing sketches. Or picking colours. Or going through design blogs. It's tough to track exactly how much work goes into each project. Some projects you figure out in 20 minutes. Some, 20 hours. Yet, advertising is a business. Your agency has corporate goals. And shareholders. And bills to pay. And profits to make. And other financial things I don't really understand. And if you don't fill out your timesheets, people get mad. I worked at one place where they shut you out of your email until you did the previous week's timesheet. Another place had a time sheet police that came around and sat at your desk until you did them. My current job sends me menacing emails about outstanding time sheets. So if you're in school, enjoy all the time you have to freely think, write, lay out, edit and stare off into space. Because one day, you're going to be held accountable. If you're working, it's Friday, don't forget to do your timesheet before you leave.